In many countries, when the potato was introduced, it was considered weird, poisonous, and evil. Potatoes were also thought to be the source of serious diseases and early death. Eventually, agriculturalists in Europe found potatoes easier to grow and cultivate than other staple crops, such as wheat and oats. Most importantly, it became known that potatoes contained most of the vitamins needed for sustenance, and they could be provided to nearly 10 people for each acre of land cultivated. Although potatoes had been introduced to the US several times in the 1600's. They were not widely known until 1719 when they were planted in Londonderry, NH by Scottish Irish immigrants. From there they spread across the nation. Preheat oven to 400 degrees. Bake for 30 minutes. Wash potatoes, cut potatoes in half lengthwise, then cut each half in thirds lengthwise. Total of 12 wedges. 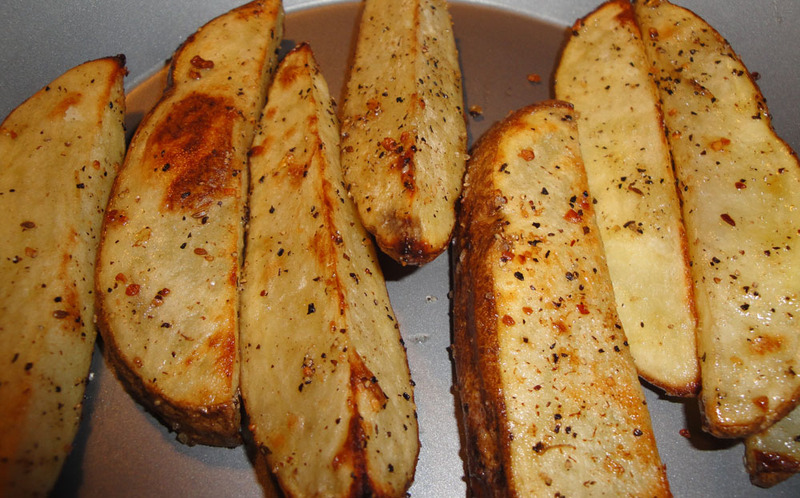 Place the potatoes on a sheet pan with extra virgin olive oil, steak seasoning, salt and pepper. Make sure hands are clean, toss all the ingredients together, making sure potatoes are covered with oil. Spread potatoes in a single layer with cut side up. Turn potatoes after 20 minutes. Bake until lightly brown. Serve immediately. Enjoy! Yum! Every now and then I get the craving for home-made potato fries. Wedges are my favorite. I love potatoes. I like to dip the wedges in ranch dressing. Thank you for your comment.